The reason behind this is that I don’t want to clone a Git repository only to get access to a package.json file. But maybe your point is that the extension repository can just be a collection of package.json files. You can access a single file in GitHub via a single HTTPS curl call, thus one could easily CURL the url and then parse the file. You want to make a registry for all of the Roon Extensions? It sounds like Roon is hoping to store all of the data for a given extensions in its own API supplied data store. So, NPM should be powerful enough to do all the heavy lifting to install the needed programs for a given Roon Extension. NPM can install other needed like Bower, etc. If NPM is the end goal for RoonLabs, then NPM itself would be the correct distribution system and repository for Roon itself. 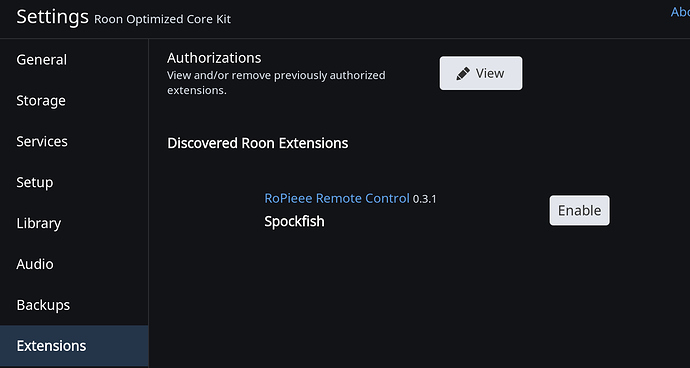 All Roon would need to specify is that all extension use the same ‘nvm’ command if Roon were to install and them and launch them. Of course, this is easier said than done… (see nombom). RoonLabs might not have published their Extensions officially yet on NPM because you can no longer delete Project once published. However, they still might assume that NPM will be the official repository for Roon Extensions. But that is just a guess on my part. ‘All’ is still countable on two hands. Have you looked at NPM’s website and look how other companies just use naming conventions? Have you looked at the Roon API and Extensions code? I always try to adapt my coding style to the “surrounding” code. Yes, I am very familiar with the current RoonLabs Github pages. Are you referring to the fact they are pointing their package.json files at Git repos? Things indeed become more straight forward when making use of some npm functionality. In the mean time I split my code in the three defined layers and created a 'child node' implementation for the lowest layer, mainly for testing purposes. Next I want to replace the git / npm commands in my install and update functions with the above alternatives. When all this is working pretty well I want to put it on GitHub so it can be used by others for integration. This is the front-end towards the lower layers. The functionality behind the auto-update time hasn’t been implemented yet, I’m working on it right now. There is no state information of the managed extensions in this layer. This layer wraps npm commands in a Node API. I could not find an existing API for this that handles packages outside the npm repository, Roon extensions currently have to be accessed via a git url. Installed packages and available updates are all queried via standard npm commands. This is a child node implementation for starting and stopping extensions. It is rather limited in its functionality, it e.g. doesn’t store the state of extensions, preventing an auto restart of running extensions after a reboot. @spockfish, It would be great if you can workout your idea to implement a ‘runner’ layer based on systemd, I can then also test this on my NUC that is running Arch Linux. I hope you can find time for this, you are very busy with the development of your image and are making great progress! As a next step maybe we can combine the different pieces of the puzzle and improve the user experience by including the Roon Web Controller in the repository of the Extension Manager and then include the manager in the RoPieee image. That would allow a user to choose between the different user interface extensions and also turn all this into a real community effort! @Mike_Plugge, @spockfish what do you think about this? Does it sound like a plan? Just sent you a pull request. I think this is adding up to be a nice system! Thanks @Mike_Plugge, Your Web Controller is in the repository now. After that the Extension Manager has to be restarted for the new extension to show up. Thanks @Boris_Pruessmann for committing your extensions! I updated the title and the first post of this topic to let it reflect the current status. Hi @spockfish, This is what we need for the runner as well. Do you know if it catches the case of a core update? After a core update I always have the issue that the node is still running (the process is there) but the pinging has stopped, causing the extension to no longer appear in the extension list. @danny, is there a possibility to set a callback on the pinging mechanism, or should an extension survive a core update? I’m not sure if this catches the core update situation. What it at least does it make sure that if the extension craps out for some reason (mine did in a few occasions ) it’s being properly restarted. I’ve discovered another issue yesterday with the Roon API in general. I was rebooting my router and in that case my extension did not came back. It was running, but it became invisible inside Roon. Looking into this I’ve found that it got a ‘core unpaired’ event, but it did not recover from that. I’ve ‘fixed’ that with an ugly hack: in that case I’m deliberately exiting the extension which is then being restarted by the watchdog construction and thus re-establishing connection with Roon. I was rebooting my router and in that case my extension did not came back. It was running, but it became invisible inside Roon. This sounds similar to the core update case. An alternative would be to call stopWatchdogMode() from the core_unpaired() callback. yeah. but that’s just a ‘nicer way’ then the exit. I’m still not too happy that the extension needs to be restarted in those scenario’s. Can’t help to think ‘there’s a better way’. I agree. Let’s wait and see if Danny can show us the better way. @Jan_Koudijs @spockfish Harry did you ever integrate Jan’s alarm into the ropieee build? Ok @Jan_Koudijs I’ve got your extension running and auto starting as well. Installing is done from a script, including the auto start process. I’m asking as I am considering killing my win10 core and just running ROCK and of course rock has no means to run node and I don’t want to have to have a pc/Mac running 24/7 just for api running. Can it be that the Windows Firewall is blocking Node from accessing the core that is now running on ROCK? All firewalls are off…and the OS X core doesn’t see it either.